I begin this post with a Letter to the Editor from a grandfather that had just read an article in the November-December 2010 issue of American Scientist. The article makes the point that school is not where most Americans learn most of their science. It was my similar belief, held two years ago, that led me to start the grandadscience blog. Here's the letter. The italics are mine. In response to "The 95 Percent Solution" by John H. Falk and Lynn Dierking (November-December), I have had the good fortune to spend a large part of my retirement babysitting my young, twin granddaughters. I have been amazed to watch their scientific experiments—testing the properties of various materials, exploring how those materials fit with other materials, picking up insects and examining them, on and on. They start, design and carry out these experiments on their own initiative. One possible conclusion to be drawn from the statistics in Drs. Falk's and Dierking's article is that it takes a number of years for the public school system to eliminate the early and natural scientific approach with which we are all endowed. Not long ago we had the pleasure of having a young man live with us for two years as he got his life together. He recently paid us a visit and had his nephew, Carlos, with him. Carlos is in the fourth grade. Passing through the kitchen, I found grandmother math and Carlos doing a 'science' investigation. 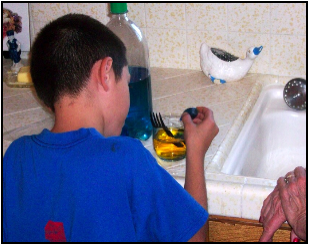 With a kitchen full of chemicals and a curious, young mind, grandmothermath quickly had Carlos investigating the combination of different colors of food coloring. In this picture, Carlos is adding a couple of drops of blue food coloring to a glass of water colored with two drops of yellow food coloring. Like most kids his age, Carlos is eager to learn science but, as he reported, all they do at school is language arts and math. Science lessons are few and far between and, when they do happen,they are typically reading lessons about science, not lesson about doing science, as grandmothermath gave to Carlos. When it came time to leave, Carlos wanted to visit again and do more science with grandmothermath. We look forward to his next visit. 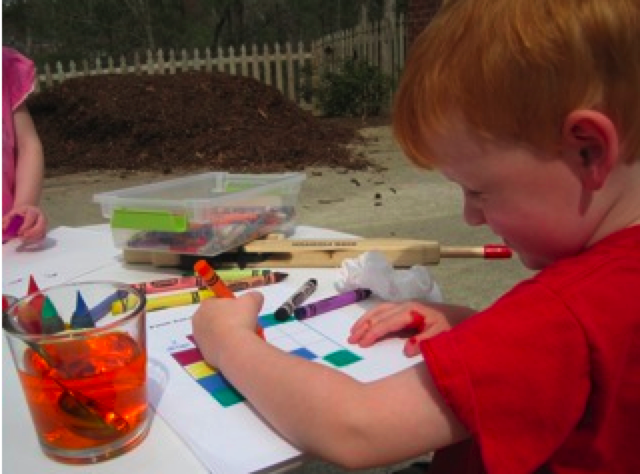 Do you know if your kids or grand kids are learning science at school? I noticed that the last three posts have featured grandsons John and Andrew. Given the above and not wanting to slight any of the other four grand kids, I sent this chart to our daughter in Georgia. I suggested that she have four-year old Asher do the investigation and send grandadscience digital pictures to post. To give Asher a simple data collection sheet, I sent Winona, Asher's mom, the following chart in pdf file format. The blank spaces are for the kids to color, based upon the color changes (if any) Asher observes when doing the investigation. 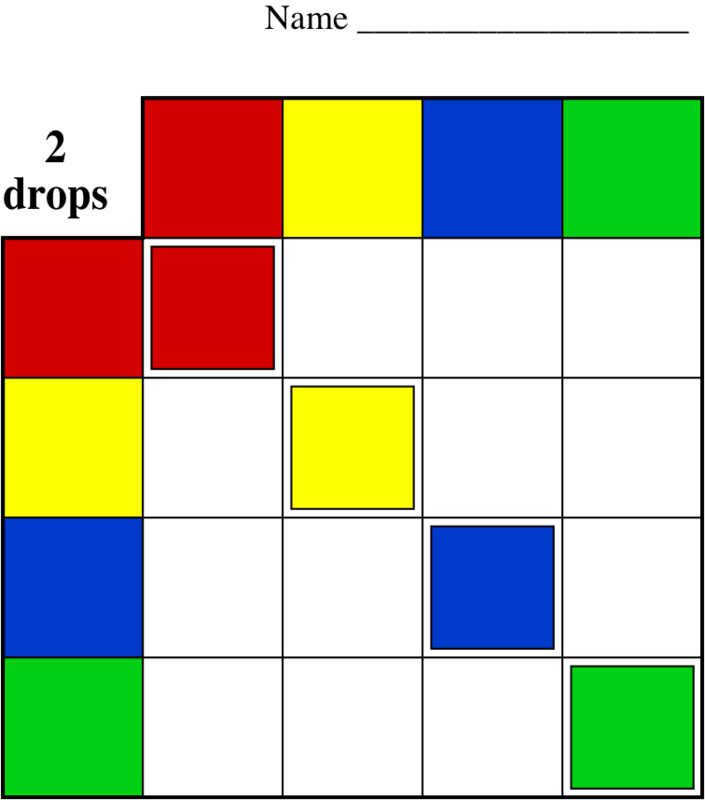 If you would like a copy of the chart to use with your children or grandchildren, just email a request for Color Chart to grandadscience@gmail.com. Here are the photos of Asher sent in by his mom. 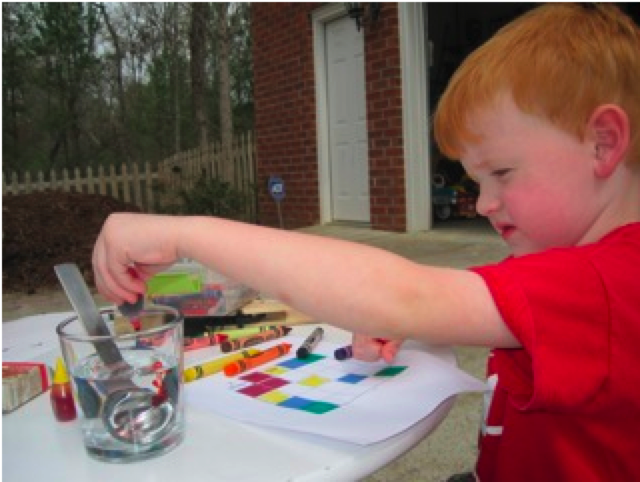 In the first picture, Asher is adding drops of red food coloring to a glass of clear water. 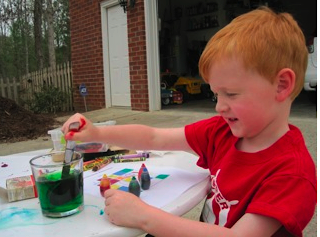 What a surprise he had when he added two drops of blue to two drops of yellow and the water turned green! Like every good scientist, Asher told his mom he wants to repeat the investigation! Science is based upon repeatability of results so he will soon get another chance to mix food coloring in water. The focus on the activity that Asher exhibits in these pictures tell grandadscience and grandmothermath that we need to send more simple activities for Asher to do.